Nina Dobrev in Crash Pad Captures are here. Crash Pad was released on Digital HD today for those who have yet to see it you can Rent and Buy it now. 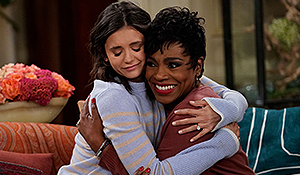 I have added Captures to the gallery from Nina’s Role as Hannah so be sure to check them out. It’s always nice getting to see Nina play in a Comedy, I will have a review up sometime in the next few days so stay tune. Be sure to share your thought’s in the comments on the movie and Nina’s role.